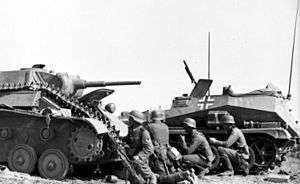 On 22 June 1941 the Wehrmacht had launched Operation Barbarossa with the intention of defeating the Soviets in a Blitzkrieg lasting only months. 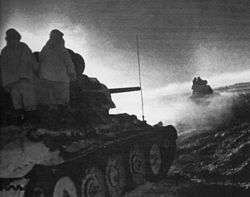 The Axis offensive had met with initial success and the Red Army had suffered some major defeats before halting the Axis units at Moscow (November/December 1941). Although the Germans had captured vast areas of land and important industrial centers, the Soviet Union remained in the war. In the winter of 1941–42 the Soviets struck back in a series of successful counteroffensives, pushing back the German threat to Moscow. Despite these setbacks, Hitler wanted an offensive solution, for which he required the oil resources of the Caucasus. By February 1942 the German Army High Command (OKH) had begun to develop plans for a follow-up campaign to the aborted Barbarossa offensive – with the Caucasus as its principal objective. On 5 April 1942, Hitler laid out the elements of the plan now known as "Case Blue" (Fall Blau) in Führer Directive No. 41. The directive stated the main goals of the 1942 summer campaign on Germany's Eastern Front: holding attacks for Army Group (AG) Centre, the capture of Leningrad and the link-up with Finland for AG North, and the capture of the Caucasus region for Army Group South. The Caucasus, a large, culturally diverse region traversed by its eponymous mountains, is bounded by the Black Sea to the west and the Caspian Sea to the east. 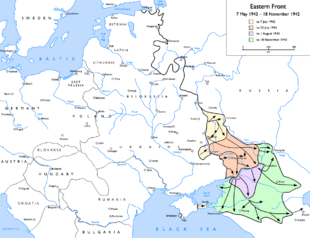 The region north of the mountains was a production center for grain, cotton and heavy farm machinery while its two main oilfields, at Maykop, near the Black Sea, and Grozny, about halfway between the Black and the Caspian Seas, produced about 10 percent of all Soviet oil. South of the mountains lay the densely populated region of Transcaucasia, comprising Georgia, Azerbaijan and Armenia. This heavily industrialized and densely populated area contained some of the largest oilfields in the world. Baku, the capital of Azerbaijan, was one of the richest, producing 80 percent of the Soviet Union's oil—about 24 million tons in 1942 alone. The Caucasus also possessed plentiful coal and peat, as well as nonferrous and rare metals. Manganese deposits at Chiaturi, in Transcaucasia, formed the richest single source in the world, yielding 1.5 million tons of manganese ore annually, half of the Soviet Union's total production. The Kuban region of the Caucasus also produced large amounts of wheat, corn, sunflower seeds, and sugar beets, all essential in the production of food. These resources were of immense importance to Hitler and the German war effort. Of the three million tons of oil Germany consumed per year, 85 percent was imported, mainly from the United States, Venezuela, and Iran. When war broke out in September 1939, the British naval blockade cut Germany off from the Americas and the Middle East, leaving the country reliant on oil-rich European countries such as Romania to supply the resource. An indication of German reliance on Romania is evident from its oil consumption; in 1938, just one-third of the 7,500,000 tons consumed by Germany came from domestic stocks. Oil had always been Germany's Achilles heel, and by the end of 1941, Hitler had nearly exhausted Germany's reserves, which left him with only two significant sources of oil, the country's own synthetic production and the Romanian oilfields, with the latter supplying 75% of Germany's oil imports in 1941. Aware of his declining oil resources, and fearful of enemy air attacks on Romania (Germany's main source of crude oil), Hitler's strategy was increasingly driven by the need to protect Romania and acquire new resources, essential if he wanted to continue waging a prolonged war against a growing list of enemies. In late 1941, the Romanians warned Hitler that their stocks were exhausted and they were unable to meet German demands. For these reasons, the Soviet oilfields were extremely important to Germany's industry and armed forces as the war became global, the power of the Allies grew, and shortages started to occur in Axis resources. Close air support from the Luftwaffe also played an important role in this early success. It contained the Red Air Force, through air superiority operations, and interdiction through attacks on airfields and Soviet defence lines. At times, the German air arm acted as a spearhead rather than a support force, ranging on ahead of the tanks and infantry to disrupt and destroy defensive positions. As many as 100 German aircraft were concentrated on a single Soviet division in the path of the spearhead during this phase. General Kazakov, the Bryansk Front's chief of staff, noted the strength and effectiveness of the Axis aviation. Within 26 days, the Soviets lost 783 aircraft from the 2nd, 4th, 5th and 8th Air Armies, compared to a German total of 175. By 5 July, forward elements of Fourth Panzer Army had reached the Don River near Voronezh and became embroiled in the battle to capture the city. Stalin and the Soviet command still expected the main German thrust in the north against Moscow, and believed the Germans would turn north after Voronezh to threaten the capital. As a result, the Soviets rushed reinforcements into the town, to hold it at all costs and counterattacked the Germans' northern flank in an effort to cut off the German spearheads. 5th Tank Army, commanded by Major General A.I. Liziukov, managed to achieve some minor successes when it began its attack on 6 July, but was forced back to its starting positions by 15 July, losing about half of its tanks in the process. Although the battle was a success, Hitler and von Bock, commander of Army Group South, argued over the next steps in the operation. The heated debate, and continuing Soviet counterattacks, which tied down Fourth Panzer Army until 13 July, caused Hitler to lose his temper and dismiss von Bock. As part of the second phase of the operation, on 9 July, Army Group South was split into Army Group A and Army Group B, with Wilhelm List appointed as commander of Army Group A in place of von Bock. Only two weeks into the operation, on 11 July, the Germans began to suffer logistical difficulties, which slowed the advance. The German Sixth Army was continually delayed by fuel shortages. Eight days later, on 20 July, shortages of fuel were still undermining operations, leaving many units unable to execute their orders. The 23rd Panzer Division and 24th Panzer Division both became stranded during the opening phase. Once again, as it had done during the Norwegian Campaign in April 1940, and Barbarossa in 1941, the Luftwaffe's Junkers Ju 52 transport fleet flew in supplies to keep the army going. The situation remained difficult with German troops forced to recover fuel from damaged or abandoned vehicles, and in some cases, leave behind tanks and vehicles with heavy fuel consumption to continue their advance. This undermined the strength of the units, which were forced to leave fighting vehicles behind. Nevertheless, the Luftwaffe flew in 200 tons of fuel per day to keep the army supplied. Despite this impressive performance in keeping the army mobile, Löhr was replaced by the more impetuous and offensive-minded von Richthofen. After crossing the Don on 25 July, Army Group A fanned out on a 200 km (120 mi) front from the Sea of Azov to Zymlianskaya. The German Seventeenth Army, along with elements of the Eleventh Army and the Romanian Third Army, manoeuvred west towards the east coast of the Black Sea, while the First Panzer Army attacked to the south-east. The Seventeenth Army made a slow advance but the First Panzer Army had freedom of action. On 29 July the Germans cut the last direct railway between central Russia and the Caucasus, causing considerable panic to Stalin and Stavka, which led to the passing of Order No. 227 "Not a step back!". Salsk was captured on 31 July and Stavropol on 5 August. Although the army group made a quick advance, by 3 August the vanguard comprised only light mobile forces and most of the tanks lagging behind, due to lack of fuel and supply breakdowns, despite the efforts of 4th Air Corps, which flew in supplies around the clock. 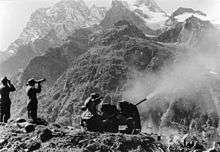 In the first week of October 1942, Hitler came to recognise that the capture of the Caucasus oil fields was unlikely before the winter forced the German forces to take up winter positions. Unable to capture them, he was determined to deny them to the enemy and ordered the Oberkommando der Luftwaffe (OKL) to inflict as much damage as possible. On 8 October, Hitler called for the air offensive to be carried out no later than 14 October, as he required air assets for a major effort at Stalingrad. As a result, on 10 October 1942, 4th Air Corps of Luftflotte 4 was ordered to send every available bomber against the oilfields at Grozny. The air fleet was in poor shape by this time – Von Richthofen had begun Case Blue with 323 serviceable bombers out of a total of 480. He was now down to 232, of which only 129 were combat ready. Nevertheless, the force could still deliver damaging blows. Attacks on the refineries reminded von Richthofen of the attacks on Sevastopol several months earlier. Thick black smoke rose from the refineries to a height of 5,500 metres (18,000 ft). On 12 October further raids caused even more destruction. It had been a strategic mistake not to have made greater efforts to hit the oil refineries at Grozny and Baku sooner as their destruction would have been a greater blow to the Soviets than the loss of Stalingrad, where most of the air fleet was deployed. On 19 November, the Soviet counter-offensive at Stalingrad compelled von Richthofen to once more withdraw his units north to the Volga and bring an end to the aerial offensive. Much damage was done at Grozny, but the remaining oilfields were beyond the logistical reach of the German Army as well as the fighter aircraft of the Luftwaffe. 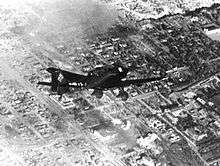 Grozny was within range of German bombers from 4th Air Corps, based near the Terek river. But Grozny and the captured oilfields at Maykop produced only ten per cent of Soviet oil. The main fields at Baku were out of German fighter range. German bombers could have reached them, but it meant flying the most direct, thus most predictable route without protection. In August it may have been possible to carry out these operations owing to the weakness of Soviet air power in the region, but by October it had been considerably strengthened. On 23 July, the main body of Army Group B started its advance toward the Don. The Germans met with increasing Soviet resistance from the new Stalingrad Front, with the 62nd and 64th Soviet Armies. On 26 July, XIV Panzer Corps broke through and reached the Don, where the new First and Fourth Tank Armies conducted several counter-attacks but the attacks were made by inexperienced troops and failed. In the south, Fourth Panzer Army made better progress against the Soviet 51st Army. After crossing the Don, the Germans advanced on Kotelnikovo, reaching the town by 2 August. Soviet resistance convinced Paulus Sixth Army was not strong enough to cross the Don by itself, so he waited for Fourth Panzer Army to fight its way north. 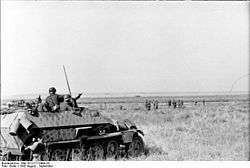 On 4 August, the Germans were still 97 km (60 mi) from Stalingrad. 1 2 Antill (2007), pp. 24–25. 1 2 Hayward (2001), p. 129. 1 2 Antill (2007), p. 29. 1 2 Hayward (2001), p. 2. 1 2 Glantz (1995), pp. 111–113. 1 2 Antill (2007), pp. 31–32. ↑ Adam, Wilhelm; Ruhle, Otto (2015). With Paulus at Stalingrad. Translated by Tony Le Tissier. Pen and Sword Books Ltd. p. 22-23. ISBN 9781473833869. 1 2 Antill (2007), p. 37. 1 2 3 4 5 Antill (2007), p. 49. 1 2 3 4 Antill (2007), p. 40. 1 2 Hayward (2001), p. 156. 1 2 Glantz (1995), p. 121. 1 2 Antill (2007), p. 39. 1 2 Liddell Hart 1948, p. 202. 1 2 3 Glantz (1995), p. 122. ↑ Zhukov, Georgy (1974). Marshal of Victory, Volume II. Pen and Sword Books Ltd. p. 93. ISBN 9781781592915. ↑ German Federal Archives. ""Die Brandenburger" Kommandotruppe und Frontverband" (in German). German Federal Archives. Retrieved 13 May 2011. 1 2 Pusca, Dragos; Nitu, Victor. "WorldWar2.ro — Romanian Armed Forces in the Second World War — The 3rd Army in the Caucasus – 1942". Retrieved 1 May 2011. 1 2 Bergström 2007, p. 62. 1 2 Nipe (2000), p. 33. 1 2 Glantz (1995), pp. 143–147. 1 2 Nipe (2000), pp. 54–64, 100. Antill, Peter (2007). Stalingrad 1942. Oxford: Osprey Publishing. ISBN 1-84603-028-5. Axworthy, Mark; Scafes, Cornel; Craciunoiu, Cristian (1995). Third Axis Fourth Ally: Romanian Armed Forces in the European War, 1941–1945. London: Arms & Armour Press. ISBN 1-85409-267-7. Beevor, Antony (1999). Stalingrad: The Fateful Siege: 1942–1943. London: Penguin Books. ISBN 0-14-028458-3. Bellamy, Chris (2007). Absolute War: Soviet Russia in the Second World War. London: Pan Books. ISBN 978-0-330-48808-2. Bergström, Christer (2007). Stalingrad – The Air Battle: November 1942 – February 1943. London: Chervron/Ian Allen. ISBN 978-1-85780-276-4. .
Glantz, David M.; Jonathan M. House (2009). To the Gates of Stalingrad: Soviet-German Combat Operations, April–August 1942. The Stalingrad Trilogy. I. Lawrence, KS: University Press of Kansas. ISBN 978-0-7006-1630-5. Hayward, Joel (1995). Too Little Too Late: An Analysis of Hitler's Failure in 1942 to Damage Soviet Oil Production. Lawrence, KS: The Journal of Strategic Studies, Vol. 18, No. 4, pp. 94–135. Liddell Hart, Basil Henry (1948). The German Generals Talk. New York: Morrow. ISBN 0688060129. Hayward, Joel (2001). Stopped at Stalingrad: The Luftwaffe and Hitler's Defeat in the East, 1942–1943. Lawrence, KS: University Press of Kansas. ISBN 0-7006-1146-0. Manstein, Erich (2004). Lost Victories: The War Memoirs of Hitler's Most Brilliant General. Minneapolis: Zenith Press. ISBN 0-7603-2054-3. Nipe, George M. Jr. (2000). Last Victory in Russia: The SS-Panzerkorps and Manstein's Kharkiv Counteroffensive—February–March 1943. Atglen, PA: Schiffer Publishing. ISBN 0-7643-1186-7. Holt, David (June 2009). "The Slovak Army: 1939 – 1945 Part 2: The Russian Campaign 1940 – 43" (PDF). Journal of The Czechoslovak Philatelic Society of Great Britain. 27 (2). ISSN 0142-3525. Retrieved 18 February 2014.